Most of the people make kuttu ki poori or kuttu ke pakore for fasting. I love those preparations too but they are better to be had occasionally. 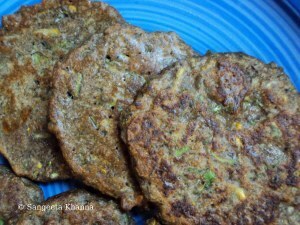 When on a nine day fast you need to have lighter meals, kuttu ki tikki (savory pancakes) will be a better option for you too. I have been buying whole buckwheat as it gets powdered very easily in the mixie, the taste of the freshly ground buckwheat flour is far more superior that the store bought kuttu ka atta. I try and get whole buckwheat if possible and get it powdered freshly whenever required. Another interesting fact is that the flour gets quite sticky when mixed with water and makes a very adhesive batter, needless to say it is easier to spread on the pan and it easily incorporates any grated veggies. 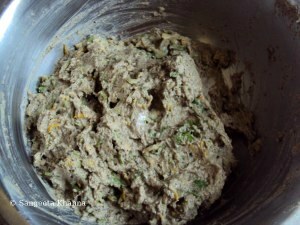 For this simple recipe I grated a small yellow zucchini and a small green on. I used zucchini as I had plenty of them from here, grated bottle guard, pumpkin or grated cabbage work very well too, and if you are not fasting try using chopped onions and make a batter with curds instead of water. That makes it taste almost like a vada. Will share that recipe sometime soon. Heat a pan with a little ghee and shallow fry like pancakes. Drop spoonfuls over the pan and flip when one side is cooked. Let it brown on the other side too and serve hot with any green chutney. Mint or coriander chutney is great with it. This pancake tastes really good with a cucumber raita or tempered yogurt. Even a coconut chutney makes a nice pairing with it. You see it is a versatile recipe, can be adapted to many versions with many vegetables and many accompaniments. I had been browsing for what is kuttu. SOunds interesting and healthy to me. Is it horse gram or ragi. Thats great ! It has been ages I ate this stuff. Lovely and tasty dish...is it a rajgara flour you used? Yummy and healthy one, looks delicious. Wow..this pancakes look yummy and healthy. I'll try out this new dish. Sangeetha, This is new to me too. But it looks so healthy and delicious. Loved that u have added ginger and green chillies to the recipe. Also I have Shared 'The Honesh Scrap award' with you on today's post. Will be happy if you accept it. oh wow, these pancakes look so delicious! i make buckwheat pancakes too but a bit differently. I should try this way soon. hi, i am back here after a long time, i see youve started posting again :) nice yummy recipe! will surely give it a shot. 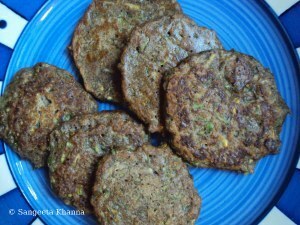 Hi Sudha .. i have not used any maida in this recipe , this is a buckwheat pancake.